Train like an Olympic Gymnast! Children's gymnastic classes to be taught by Olympic Silver Medalist at the Los Angeles School of Gymnastics. Every Olympic athlete begins the same way, with a great coach at a fantastic gymnastics studio. Olympic Fever is palpable at Los Angeles School of Gymnastics, a premier gymnastics training facility in Culver City, CA, and home to Olympic medalists, coaches, and hopefuls. With the incredible success of Simone Biles and other U.S. gymnasts this year, the "Olympic Fever" has swept through Los Angeles School of Gymnastics, stimulating children of all age to engage in courses, training programs, and after school programs focused to one day becoming an Olympic medalist. 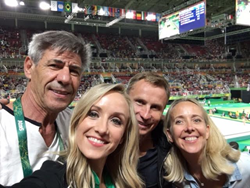 An Olympics Silver Medalist, LA School of Gymnastics Head Coach Yefim Furman serves as the NBC Olympics consultant for the 2016 Olympic Games TV coverage in Rio. Coach Yefim, as he is affectionately known by his students back in Culver City, shares his ground floor experience of the "Fierce Five" performance, men's gymnastics events, trampoline and tumbling categories, directly from Rio. The Olympics Spirit is also shared by Executive Director Alla Svirsky, a three time Olympic coach, seven times USA Gymnastics Coach of the Year, USA Olympic Judge and an Inductee to the Gymnastics Hall of Fame. Ms. Svirsky was involved in the 1984, 1988, 1992, and 1996 Olympic Games, where she coached athletes or served on the judging panel. She is very excited about the success that the USA athletes have had at the Olympics over the many decades, culminating with this year's unprecedented performance. Tanya Berenson, General Manager at Los Angeles School of Gymnastics happily accepts the Olympic coverage from the ground floor in Rio for the community to enjoy. As a strong supporter of the Olympics and gymnastics training in Los Angeles, Ms. Berenson was featured in the #LA2024 campaign video to bring the Summer Olympics back to Los Angeles 40 years after it hosted the '84 Games. The LA School Of Gymnastics is a non profit organization run and managed by Olympic participants, medalists, and coaches. LA School of Gymnastics offers programs for kids ages 3 and up and a multitude of skill sets. This organic program is mindful of the Rio Olympics that your children watch on TV. The children's gymnastics program is located in Culver City, California and their facility accommodates classes at all times of the day. The 2016 Olympics in Rio are an international, steadfast tradition of athletic prowess and lifelong dedication. The Summer Olympic Games occur every four years and their creation was inspired by the ancient Olympic Games held in Olympic, Greece from the 8th century BC to the 4th century AD. This year is the first time that the Olympics have ever been held in South America. Gymnastics is one of the most popular sports at the Rio Olympic Games 2016. Olympic fever has set in as millions of Americans gear up to watch the exciting competitions between the world’s best athletes! There will be a range of thrilling gymnastic events taking place at the Summer 2016 Olympics, including both men’s and women’s Artistic Gymnastics with events like: Floor Exercise, Pommel Horse, Still Rings, Vault, Parallel Bars, Uneven Bars, and Balance Beam. Additionally, Rhythmic Gymnastics combines elements of ballet, gymnastics and dance and challenges participants to use rope, hoops, balls, clubs, and ribbons. This year’s Olympic team is rich with skill, physical prowess, and passion! Every Olympic athlete begins the same way, with a great coach at a fantastic gym. Our gymnastics classes will introduce future Olympians to the best coaches and premier gym equipment. We know that future Olympians deserve a coach who is suited to their individual learning style, can motivate them to the best of their ability, and supply the proper environment. Since 1975, the Los Angeles School of Gymnastics has been a leading source for quality gymnastic instruction, rhythmic gymnastics in Los Angeles, and many other innovative programs and well-rounded curricula that support happy and healthy children. If you would like more information about this topic, or to schedule an interview with LA School of Gymnastics, please tanya(at)lagymnastics(dot)com.